I’m very pleased to report that Endless is now up as book of the month at Fantasy Book Review. It’s currently quivering alongside the excellent likes of Brent Weeks, Lou Morgan, Andrez Bergen, and, surreally enough, Mikhail Bulgakov’s Russian masterpiece, The Master and Margerita. 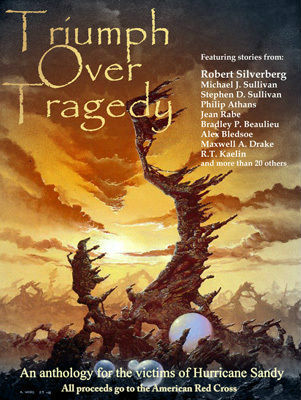 In other news, my short story In The Glimpses will be included in an upcoming anthology for the victims of Hurricane Sandy, entitled Triumph Over Tragedy. All proceeds will be going to the Red Cross. Click on the pic to the left to visit the book’s campaign page.